One of the highest grossing films in 2008, ‘Kung Fu Panda', about a panda who aspires to be a Kung Fu warrior is now being screened at the Majestic cinema in Colombo. 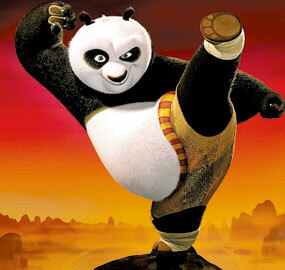 The animated film about a bear named 'Po' with a passion for martial arts has become a huge hit in China. Globally, the movie has earned $275 million in just two weeks. Released on June 6, the action animation is directed by Mark Osborne and John Stevenson. The film premiered at the 61st Cannes Film Festival where it received a good response with massive and sustained applause at the end of the film's screening. Enthusiastic, big and a little clumsy, Po is the biggest fan of Kung Fu around...which doesn't exactly come in handy while working every day in his family's noodle shop. Unexpectedly chosen to fulfill an ancient prophecy, Po's dreams become reality when he joins the world of Kung Fu and studies alongside his idols, the legendary Furious Five -- Tigress, Crane, Mantis, Viper and Monkey -- under the leadership of their guru, Master Shifu. But before they know it, the revengeful and treacherous snow leopard Tai Lung is headed their way, and it's up to Po to defend everyone from the oncoming threat. Can he turn his dreams of becoming a Kung Fu master into reality? Po puts his heart - and his girth - into the task, and the unlikely hero ultimately finds that his greatest weaknesses turn out to be his greatest strengths. The film stars the voices of Jack Black, Jackie Chan, Dustin Hoffman, Angelina Jolie, Lucy Liu, Seth Rogen, David Cross and Ian McShane. Animated by Dreamworks and distributed by Paramount Pictures, the film created controversy in China though it made one of the strongest movies in China in recent years with a grossing of more than $12 million after less than two weeks of its release. Some Chinese critics has demanded to protest the film because Steven Spielberg, a top executive at DreamWorks, had resigned last February as artistic adviser to the 2008 Beijing Olympics after failing to persuade Chinese officials to do more to help the Darfur region of Sudan. Another group, backed by the Chinese artist Zhao Bandi, who uses pandas as an inspiration for his work, also called for a boycott, saying the animated film was exploiting a national symbol.